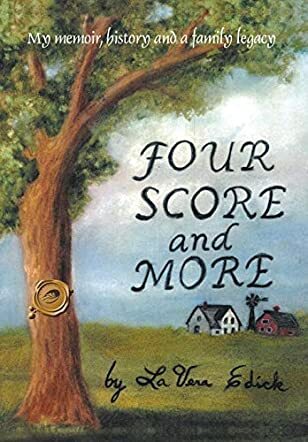 “Fourscore and More: a Memoir, History and a Family Legacy” offers an all-in-one fascinating glimpse into a bygone era. LaVera Edick has penned an interesting history of her family that makes for interesting reading, even if you are not related to her. The story begins in 1914 with the wedding of her parents. The author, born in 1925, offers a richly detailed, and fascinating glimpse into growing up on a farm and her family dynamics. She takes the reader through the years of the Depression, a World War, and the struggles of one woman as she grows beyond farm life to marriage, family, and the challenges of a modern era. The story is filled with personal reflections, often amusing memories, and oh-so-personal glimpses into family life in a simpler (or so we think) time. The stories Ms. Edick relates, and the photographs she includes in her book, immerse the reader into a history that is not displayed in history or geography books. The story is touching, very personal, and filled with a myriad of emotions as one woman describes her life and the lives of her family and ancestors; lives of sacrifice, dedication, fortitude, and most of all, determination to succeed and thrive. Ms. Edick’s use of descriptive language, narrative, and dialogue blend to create an interesting, and easy to read work that pulls the reader in from the first page. She evokes the emotions of readers with little obvious effort, and her prose is not only entertaining, but also well-constructed and conceived. "Four Score and More" offers much more than a family's genealogy, the heart and soul of an American family as well.